It'll solve a few problems. More likely, even when USB4 is fully implemented around 2021, confusion will linger. You can't blame the USB Implementers Forum (USB-IF) and the USB Promoter Group (USB-PG) either, tempting though it is. THey are organizing groups that ratify standards and help certify hardware. With literally tens of thousands of vendors making USB devices, it’s akin to herding cats. And because USB goes into everything from five-cent USB keys to $50,000 servers, the group says it has to leave it up to vendors to choose what’s best for the product. On the other hand, vendors don’t always make decisions that make sense to consumers. Take the blue USB Type-A ports, which should have easily denoted the then-new 5Gbps USB SuperSpeed support, rather than the older black USB 2.0 ports. While most PC vendors adopted the blue as they were “encouraged” to do, some vendors stuck with black because—we kid you not—it looked better. In the end, we got a rainbow of USB Type-A ports that indicated nothing. We'll help you decipher what the USB landscape is today and where it’s headed with USB4. We'll start with some short answers for what you need to know, then follow with more detail if you want to dive deeper. What's a specification? : A specification, such as the USB4 specification, is a document that describes a technology and how to implement it, and is something that's been agreed upon by a standards group or trade group. All manufacturers of the product are expected to follow the specification, though they may choose to follow only parts of it (this is where the confusion starts with USB). What's a protocol? : A protocol, in the context of USB connectivity (and networking in general), is a term that describes how two devices communicate with one another. The protocol may describe the nature of the data and how it is sent, and also what the physical delivery system is (usually a cable). A protocol may be released as an entire specification, or be part of a specification. 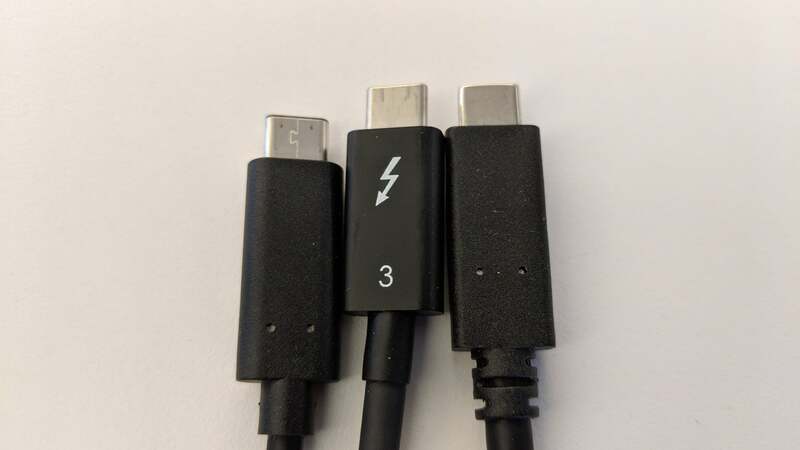 When we say below that USB4 will incorporate the Thunderbolt 3 protocol, it means that Thunderbolt 3-connected products will be able to work through USB4 ports—assuming the vendor implements the support, and assuming an appropriate cable is used. Oh sorry, was that confusing? What is USB4? It's a new specification for a future generation of USB connectivity (think 2021 and beyond). USB4 promises to simplify to one connection type (USB-C) and be capable of up to 40Gbps transfer speed. It's the next step after USB 3.2, which is coming soon. You may be wondering why it’s called USB4 rather than USB 4.0. The USB Promoter Group (USB-PG) is going with that spelling, at least for now. 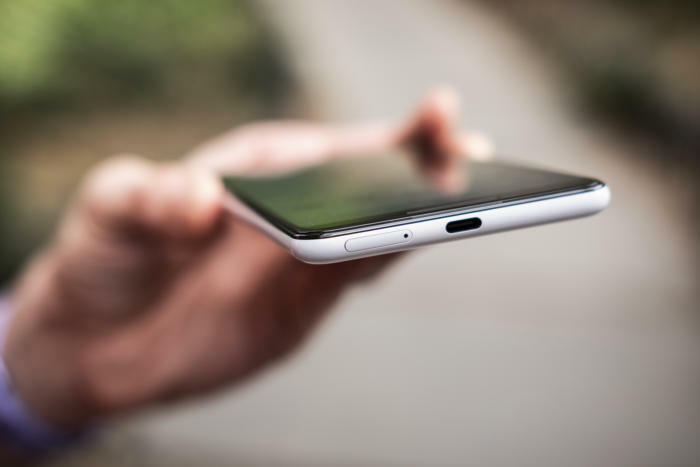 The belief is the public and press became too fixated on that decimal point in USB 3.1 and USB 3.0, instead of focusing on the capability and purpose of the spec. Thunderbolt 3 and USB4 aren't the same, just closely related. What is Thunderbolt? 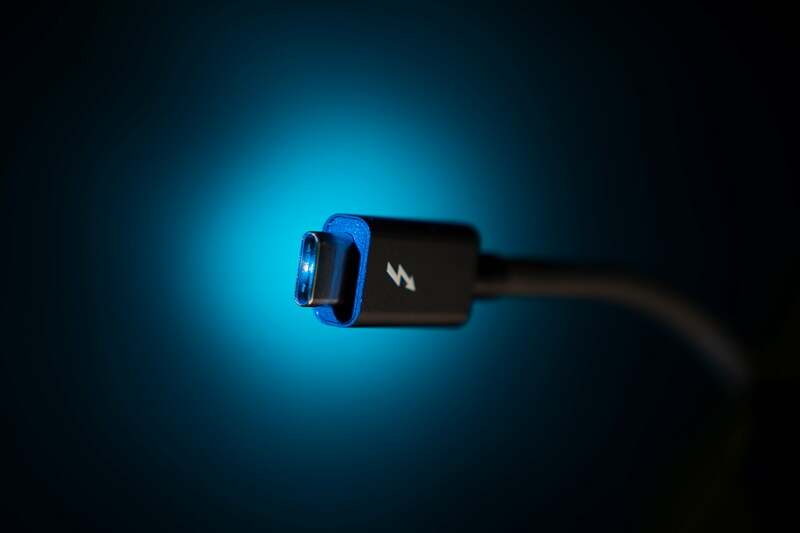 : Thunderbolt (TB) is an Intel technology that was intended to be "one cable to rule them all," whether you wanted to connect an external drive, hook up a display, or charge a smartphone. The reason it’s not ruling them all yet is because Intel kept tight control of the technology, making implementation expensive and therefore undesirable for many PC makers. The current iteration, Thunderbolt 3, has a data transfer rate of up to 40Gbps. It bundles PCIe, USB, and DisplayPort data, along with the capability to send up to 100 watts of power to charge a small device, such as a smartphone. Its connector uses the same form factor as USB-C, but unless your USB-C port is also a Thunderbolt port, Thunderbolt devices won’t work with the port. Is the USB4 spec the same as the Thunderbolt 3 spec? Not really. USB4 provides support for Thunderbolt 3, but whether a certain USB4 implementation supports it will be up to each manufacturer. Is the USB protocol the same as the Thunderbolt protocol? Currently, no. USB signaling protocols have been on their own path since USB was first introduced in 1996. Intel and Apple introduced Thunderbolt in 2011, and it essentially carries PCIe signaling for most of its data transfer purposes. In real-world terms, it boils down to having the right cables and ports for the job. If your USB 3.1 Gen 2, USB 3.2, or USB4 port supports Thunderbolt 3, you can connect a Thunderbolt 3 device to it, provided the cable also supports Thunderbolt 3. Cables that support USB data transfer, but not TB data transfer, won’t work. What’s the short version of what I need to know about USB4 and Thunderbolt 3? USB4’s embrace of Thunderbolt 3 may mean less confusion about what works with which. However, it’s still up to the vendors to implement the spec, and it’s possible some Thunderbolt 3 devices will be left in the cold. For more details, keep reading. To understand how Thunderbolt and USB work together (or not), it helps first to explain how USB’s different spec generations work together. Backward compatibility is one of USB’s advantages, but also one of its challenges, as it by definition defers to the lowest common denominator. This USB chart will show you each spec version, its maximum data transfer rate, and the connector type it supports—the boxy USB-A, or the curvy USB-C. Newer, faster USB devices will work with older, slower ports, but only at the older speed. Similarly, older, slower USB devices will work in newer ports, but only at the old speed. The same goes for the cables that connect the devices to the ports: The cables may support a certain speed, but ultimately the port’s speed rules. All Thunderbolt 3 ports in a PC support SuperSpeed 10Gbps speeds (USB 3.1 Gen 2). They should do the same for the upcoming USB 3.2. Where it gets downright messy is with Thunderbolt 3 drives. Plug a Thunderbolt 3 drive enclosure into a Thunderbolt 3 port with a 40Gbps Thunderbolt 3 cable, and in theory you get your 40Gbps-or-so (40Gbps in each direction shared across PCIe and DisplayPort). But take that same drive and plug it into a USB port that doesn’t support Thunderbolt 3, and you’ll get nothing. 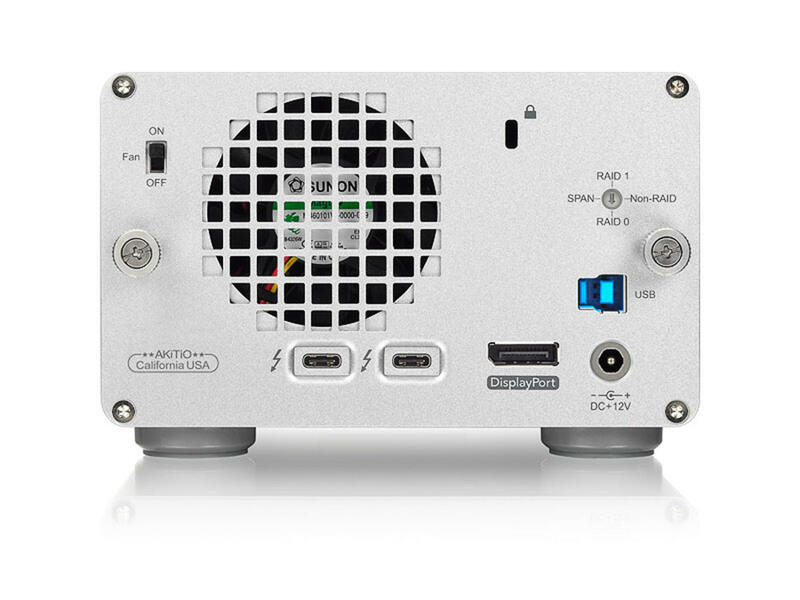 Most of the chipset controllers in the drive enclosures do not support USB over the Thunderbolt 3 port, even if the PC does. Like most drives, Akitio’s Thunder 3 Duo Pro features Thunderbolt 3 ports. Its USB mode must use a separate USB cable. To get around this, most drives (such as Akitio’s Thunder 3 Duo, above) add backward compatibility with USB-only PCs by including a separate USB SuperSpeed 5Gbps port on the drive with its own controller. Alternatively, Intel’s new Titan Ridge Thunderbolt 3 controller adds native USB SuperSpeed 10Gbps to the actual USB-C port in the drive enclosure. You should be able to plug a USB-C connector cable into any Titan Ridge enclosure, and then just plug it into either a Thunderbolt 3 port in a PC or any other USB-C port in a PC. Unfortunately, this doesn’t mean that all USB4 ports will support Thunderbolt 3. Remember, the USB-IF can only politely “encourage” vendors, the same way you’d encourage a guest to take their shoes off when they enter your house, or wash their hands after they use the bathroom. The USB-IF and USB-PG believe most manufacturers will implement the full spec, because any device that needs the high-speed modes of USB4 would most likely support the legacy Thunderbolt 3. Still, compliance will likely depend on the device. A $250 budget laptop or a smartphone could be dicey. A $1,900 rose-gold laptop likely will, because the laptop maker knows high-end buyers are looking for high-end features such as eGPU support. Devices such as the Google Pixel 3XL and future iterations really don’t need the high-speed capability of USB4, so they probably won’t carry the full 40Gbps data rates. We have to wait for the final USB4 spec to know how the cable situation will sort out, but this is what we think will happen. Passive Thunderbolt 3 cables (ones without a controller) are typically a maximum of 18 inches in length and can transfer up to 40Gbps. Most will also work to carry USB signaling when plugged into a laptop or phone without Thunderbolt 3. You can push a passive cable’s length to two meters, but the top speed drops to 20Gbps. The cable in the middle is a Thunderbolt 3 cable. One of the other cables is also Thunderbolt 3-capable while the other is a USB-only cable. Clear as mud, yes? If you need a Thunderbolt 3 cable that stretches longer than that without losing more speed, you need an active Thunderbolt 3 cable (with its own controller). Active Thunderbolt 3 cables cost about three to four times that of similarly long USB-only cable, and are limited to only 480Mbps (USB 2.0) for USB transfers. 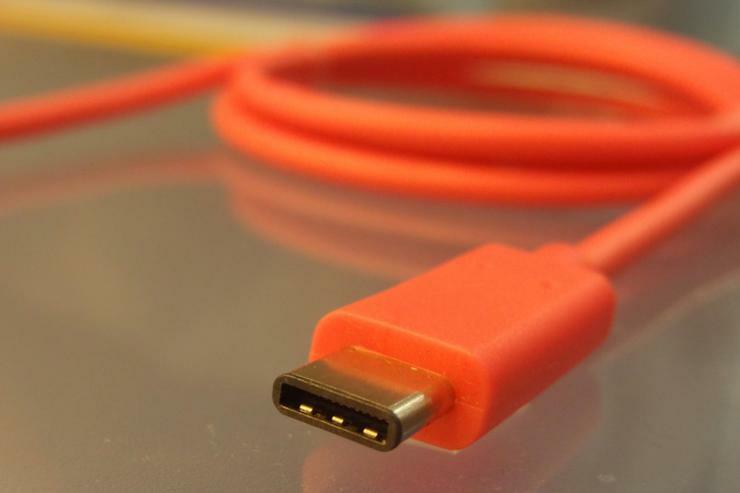 When USB4 comes along, a passive Thunderbolt 3 cable that is essentially a really high-quality USB-C SuperSpeed cable should (we say ‘should’ because the spec is not finalized) hit SuperSpeed 10Gbps or SuperSpeed 20Gbps speeds in USB4. Will you hit 40Gbps? That’s unknown. As for those long active Thunderbolt 3 cables, they’ll work to connect Thunderbolt 3 drives to a computer’s Thunderbolt 3 port, including USB4 ports that support Thunderbolt 3. But they won’t work with other USB devices. Still confused by USB-C cables and how fast they’ll run? Maybe this chart will help a little. We won't even get into “Full Featured USB-C” cables vs. non Full Featured USB-C cables. What will happen when I plug my USB-C cable into a new USB4 port? Anyone’s random collection of USB-C cables will work at up to their rated speeds in a USB4 port. A SuperSpeed 10Gbps-rated cable will run at least 10Gbps, and it might possibly rise to the occasion of USB 3.2’s new 20Gbps speed. If you want to use the newest and fastest 40Gbps speed from USB4, however, you’ll need new cabling. Check the labelling carefully, as USB-C cables run the gamut from fastest “full-featured” to USB 2.0-speed cheapies. Why come out with USB4 right after USB3.2?! Gearheads collectively slapped foreheads when USB4 was seemingly announced right on top of USB 3.2. The confusion lies in what’s being announced. The USB 3.2 spec was announced in July, 2017, and the spec published in September, 2017. Since then, manufacturers have been working to implement the spec in actual products. The USB-IF’s most recent announcement promised that the first hardware using the USB 3.2 spec, aka SuperSpeed USB 20Gbps, would go on sale this year. USB4’s news is just that hey, we’re working on the spec. Even if the USB4 spec gets published this summer, we probably won’t see actual hardware until at least 2021. Will USB4 be available for USB-A ports? No. Technically, USB4 is intended to be available only for USB-C ports. USB has always been about respecting legacy, though, so you’ll be able to plug a USB4-based peripheral into a USB-A port using a dongle. It won’t operate at USB4 speeds, but it should function at that port’s speed. This USB-C port is clearly labeled as a SuperSpeed port which means 5Gbps is its maximum speed. Will USB4 make it easier to understand what the USB-C port on my new laptop does? Probably not. If history provides any precedent, laptops will continue their slow evolution from physical USB-A ports to physical USB-C ports. Right now, many have a mix of ports. 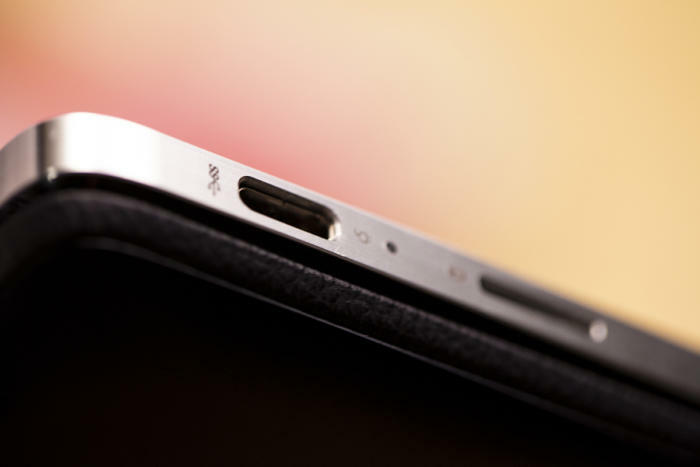 For their part, USB-C ports will continue a slow evolution from supporting USB 3.1 Gen 1/Gen 2 to USB 3.2 to USB4. Many laptops already mix USB port types and USB specs. It’ll take years to shake out. Does USB4 mark the end of Thunderbolt 3? The future of Thunderbolt is a bit murky. USB4’s incorporation of the spec suggests redundancy. However, the USB-IF and USB-PG wouldn’t comment, and Intel officials we queried remained cryptic about Thunderbolt’s future. The most telling clue might be who retains control. When Intel helped created USB, PCI, SATA, PCIe and NVMe, it gave up control of the technologies to various third-party committees. While Intel has opened up Thunderbolt 3 to wider use, the company still maintains control of it. Intel also continues to integrate TB directly into its CPUs. This indicates to us, at least, that Intel will likely continue to develop it. I’m still confused about USB. Could you give me a chart to make me feel better? The various USB specs and terminology that have been used correctly and incorrectly could be the world’s greatest card or board game. Sure. Although, to be honest, the multiple specifications and shifting nomenclatures could just as well make you feel worse. USB-PG chief Brad Saunders said consumers don’t really care about the protocol, as long as it works. That’s the dream, if not the reality.